McClintock Drive, Tempe. The left buffering necessitates a “criss cross” maneuver. The project area is University Drive between east of Priest Dr and Farmer Ave [correction: it’s actually Ash, a few hundred feet further east; i did not update the crash history, below; i don’t think it would change much]. There are other aspects of the project I like very much, e.g. 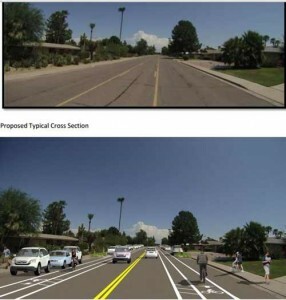 the new raised medians. These should make the road safer for all users. The speed limit is still posted at 40mph, I encourage the city to lower the limit to 35mph, which would make the road even safer for everyone. Is it really 20 times more dangerous? Cycle Tracks are NINE TIMES safer than roads? The design of the study is intriguing: it’s based on randomly choosing a “control site” along the participant’s (i.e. the crash victim) route. Cycle Tracks are NINE TIMES safer? Undoubtedly, the incredibly safety differential of “cycle tracks” will be the main take-away. The study found them to be NINE TIMES safer compared to their reference street (essentially a “worst case”: a mulitlaned arterial with on-street parking and no bicycle facilities whatsoever). The actual result is OR 0.11 (0.02, 0.54) — that is to say Odds Ratio of 11 percent, with a 95% confidence interval between 2 and 54%, compared to the reference road. And even regarding the Burrard Street Bridge cycle-track, the timeline seems to conflict/overlap somewhat with the study dates. According to a surprisingly detailed account on wiki a test of what sounds to be the cycle-track was “to begin in June 2009. The proposed trial began on July 13. It saw the southbound motor-vehicle curb lane and the northbound-side sidewalk allocated to bicycles, with the southbound-side sidewalk allocated to pedestrians. The reassigned lane was separated from motor vehicles by a physical barrier” The timeline of the study was for bicyclist injuries presenting to the ERs “between May 18, 2008 and November 30, 2009″. But wait? According to this (from mid-2011, i think, the date is unclear), Tesche said there are other cycle tracks: “However, we were able to examine separated bike lanes elsewhere in the city, including Burrard Bridge, Carrall Street, and other locations that met our definition: that is, a paved path alongside city streets that’s separated from traffic by a physical barrier,” Teschke told councillors. The highest median observed motor vehicle speed along major roads was 44kph (27mph)! This is comically low compared to what I am used to here in Phoenix. Intersting trivia answer: 27.79mph — the fastest time on record for a person running. One-third of the incidents involved collisions with MVs. The balance were various types of falls or collisions with objects. The one-third number is pretty close to the 26% reported by another ER-based survey of bicyclist injuries ( Injuries to Pedestrians and Bicyclists: An Analysis Based on Hospital Emergency Department Data. linked here ); though this isn’t directly comparable, e.g. in the former case, mountain biking was not eligible for the the study, whereas in the latter it was any sort of injury incurred on a bike. There was a bunch of interesting data collected in the survey (which the author’s are nice enough to give a link to) that are not in the final study. I’m not sure why. I would have been interested to see various spins on lightness/darkness vs. cyclist’s light usage. Likewise, Harvard researcher Anne Lusk, et. al (includes Peter Furth, Walter Willett among others) has claims of safety increases Risk of injury for bicycling on cycle tracks versus in the street, brief report Injury Prevention. Streetsblog.org is expectedly uncritical, but a through rebuttal by mathemetician M Kary can be found hosted on John Allen’s site(older, 2012), and more recently (Jan2014) including links to Kary’s two original unedited letters, as well as the published commentary in Inj Prev. , which includes a rebuttal from the authors. There is some other rebuttal from Ian Cooper, in a comment below. Methodology aside, though the study claims an increase in safety, it found only a modest increase: “RR [relative risk] of injury on cycle tracks was 0.72 (95% CI 0.60 to 0.85) compared with bicycling in reference streets”. I.e. a 28% reduction in crashes. They had an interesting reference to Wachtel and Lewiston 1994, a much-cited sidewalk study. from 3.75 to 54 in the United States”. The first number is footnoted to Pucher/Irresistible (which is discussed and linked here), and the second to, if you can believe it, a study of Boston bicycle messengers (Dennerlein, 2002. I haven’t bothered to look that one up). In Pucher, it’s in Fig 10 where they quote US injuries at 37.5 per 10 million km for the period 2004-2005, sourced to US Department of Transportation (2007), which is/are Traffic Safety Fact Sheets according to the footnotes. Pucher does, um, mention that injury rates comparisons across countries are particularly suspect; Figure 10 would lead on to believe the UK and US have similar fatality rates, whereas US injury rates are quoted as SEVEN TIMES higher. (Pucher’s claim/point is that NL and DK are very safe, while US and UK are very dangerous). In any event TSF does not list injury rates per unit of travel, only number of injuries, e.g. TSF 2005 quotes 45,000 injuries (these are presumably some sort of statistical estimate?). To get the rate estimates, he uses one of the surveys (household trans survey?). Paul Schimek gathered data on the 19 cycletracks listed in table 3; he added another column “intersections per km” and sorted them into two groups, 1) Urban Side Paths and 2) Side Paths with Minimal Crossflow. And as would be predicted by traffic engineering principles, the former had very high (7.02) versus the latter which had very low (0.57) crashes per 1 Million bicycle kilometers. The published letter-the-editor of AJPH is available in full on pubmed (or draft version on google docs) which is well worth reading. He, by the way, provides an estimate for whole US bike crashes at 3.5 per 1M bike km’s; which fits rather nicely between the high/low cycletrack numbers. The bottom line is that the AASHTO guidelines (which prohibit the on-street barriers; but permit bicycle paths adjacent to the roadway where there is “minimal cross flow by motor vehicles”) , contrary to Lusk’s assertions, are well-founded. This blog post at bicycledriving.org also discusses the same AJPH article, with links to both Schimek’s published letter, and Lusk’s published response. This is wrapped up in an article the Paul wrote A Review of the Evidence on Cycle Track Safety, Paul was kind enough to send me draft copy dated October 10, 2014. Oh, and here is John Forester’s review of Lusk’s May AJPH article. In summary, Forester says “This review does not evaluate Lusk’s method of calculating car-bike collision rates. However, the cycle tracks with high collision rates are all in high-traffic areas with high volumes of crossing and turning traffic, while the cycle tracks with low collision rates are all in areas with low volumes of turning and crossing traffic. That is what should be expected, but it says nothing about any reduction in collisions that might have been caused by the introduction of cycle tracks. The data of this study provide no evidence that cycle tracks reduce car bike collisions”. bike paths adjacent to the street, between the curb and the sidewalk (Villanova Ave.). … The on-road lanes worked best, the behind-parking lanes were the worst, and the adjacent paths were found to work in certain circumstances. lane between the moving cars and parked cars” without saying why. Sycamore Lane Experiment: This 1967 bike lane used concrete bumpers to separate parked cars from the bike only lane. The parked cars screened the visibility of bicyclists coming into intersections and cars would unknowingly drive into the bike lane. This bike lane design was eventually abandoned. 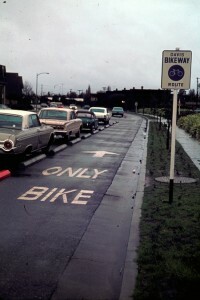 The 1967 separated bike lanes on Sycamore Lane didn’t prevent conflicts with turning vehicles. Today at this intersection there are special bike-only traffic signals that provide cyclists their own crossing phase. These innovative bicycle signals were the first of their kind to be installed in the United States. Selection bias: uses comparison streets instead of a before-after situation; study claims greatly increased safety on cycle tracks, but the cycle tracks chosen for the study were not representative of a typical cycle track, in that all were on roads with limited or nonexistent road intersections. 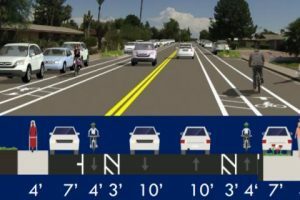 It is not surprising that bicycle facilities that have little or no possibility of interaction with motor vehicles are safer than those that have many such possibilities, and if all bicycle tracks were completely separated from turning and crossing traffic, they would indeed be safer than cycling on the road. The problem is, cycle tracks with few road intersections are very rare indeed. The infamous Lusk study. 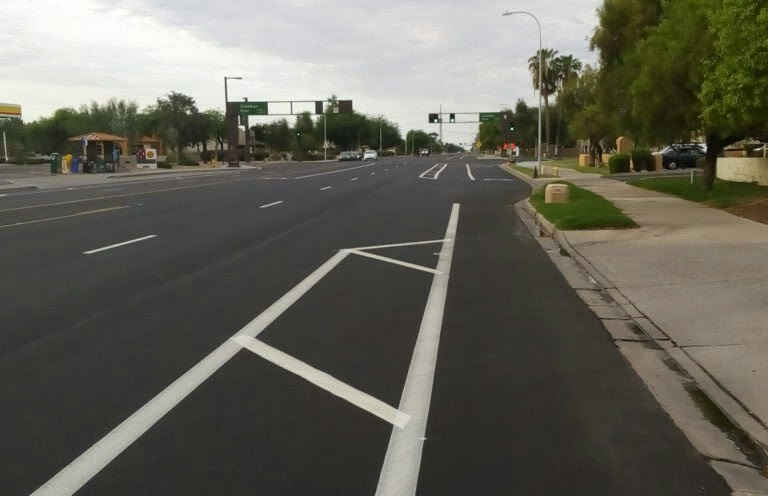 Selection bias: study claims increased safety on bicycle specific infrastructure, but its street comparisons are flawed – the streets compared were in no way similar other than their general geographic location. Busy downtown streets with multiple distractions per block were twinned with bicycle tracks on quieter roads with fewer intersections and fewer distractions..